Polycarbonate is best material after aluminum for making hard material luggage, and is available in variant colors unlike aluminum made luggage. Polycarbonate material provides durability, strength, weightlessness and scratch resistant luggage. Global luggage market generated USD 39.40 billion in 2017. Polycarbonate luggage market is greatly impacted by global luggage market along with the other growth impacting factors. The growing urbanization in a region is impacting the preference of consumers, a shift towards using polycarbonate luggage. The rising number of travelers is another impacting factor in the growth of global polycarbonate luggage market. In 2017, total number of international travelers was doubled since 2015, influencing the total sales of polycarbonate luggage. On an average, a traveler has minimum two sizes of luggage, which is used as per the purpose of travelling. Thus, there is enormous scope for polycarbonate luggage to be the preferred choice of consumer while purchasing new or replacing old luggage. Goldstein Research analyst forecast that the global polycarbonate luggage market size is set to reach USD 138.6 million by 2025, growing at a CAGR of 3.3% over the forecast period. The technological developments, growth in travel and tourism industry, shifting preference towards online distribution channel, demand for solutions to heavy luggage are some of the factors impacting the growth of global polycarbonate luggage market. The report covers the present ground scenario and the future growth prospects of the polycarbonate luggage market for 2017-2025 along with the global sales and global revenue of the polycarbonate luggage. We calculated the market size and revenue share on the basis of revenue generated from major players across the globe. We have forecast the market on the basis of polycarbonate luggage production, manufacturers, plastic production, and plastic recycling. On the basis of product type, large luggage accounted for largest market share of 34.6% in 2017 of the global polycarbonate luggage market. Light weight and easy to carry feature of polycarbonate luggage has taken over the traditional large luggage, which has made travelling convenient for the people. Online distribution platforms are gaining wide acceptance, and it is growing at a rate of 6.4% annually. Polycarbonate luggage market outlook 2017-2025, has been prepared based on an in-depth market analysis from industry experts. 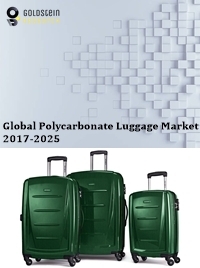 The report covers the competitive landscape and current position of major players in the polycarbonate luggage market. The report also includes porter’s five force model, SWOT analysis, company profiling, business strategies of market players and their business models. Global polycarbonate luggage market report also recognizes value chain analysis to understand the cost differentiation to provide competitive advantage to the existing and new entry players. The trend of manufacturing designed luggage, a shift from the boring looking luggage in terms of color and designs. People are attracted towards buying trendy luggage, marking the growth in global polycarbonate luggage market. The rising travel and tourism industry is driving the growth of global polycarbonate luggage market. Global Travel and tourism industry has outpaced its performance over the past decade, which accounted USD 1.2 trillion in 2017. Along with numerous benefits associated with polycarbonate luggage, its inflexibility feature restricts the sales over other fabric-made luggage, which can overstuff. Fabric-made bags such as duffle bags which are flexible and can be adjusted in different spaces have a leap over the global polycarbonate luggage market. Global polycarbonate luggage market report comprises of the following companies as the key players in the polycarbonate luggage market: Samsonite International S.A., Fox Luggage INC., Antler, Victorinox, Travelpro Products Inc., Rimowa GmbH, Delsey Paris, Safari Industries Limited, Pierre Cardin, Tumi Holdings Inc., Novex Luggage, Away Travel. What is the revenue of polycarbonate luggage market in 2016-17 and what would be the expected demand over the forecasted period?